Im not trying to be mean just by posting this here but honestly, I would like my readers/customers and any1 who reads this to step into my shoe and tell me if Im right or wrong? And so, I bought this dress from Chiffonier Couture which is managed by an acquaintance & her boyfriend. I wanted to support her, afterall its not easy setting up an online business considering that Im using the online way of advertising my business. 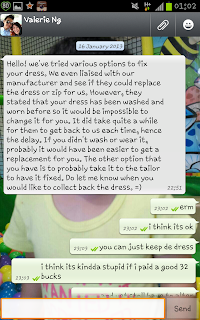 Anyway, I received the dress in late oct/early nov (I cant exactly rmb the exact date as Im quite busy) I checked that all the threads are secured & that the zip was usable before throwing it into the machine. Honestly speaking, I wouldnt bother complaining if I didnt check the item and yet threw it into the machine but fact was I checked my item without trying it on. Cos knowing that even if it did not fit me I still need to keep it an wont get an exchange. So, after washing the dress I didnt bother using it yet as I was preparing to wear for a wedding in end Nov, few days before the wedding I actually tried on the dress (THANKFULLY I DID) and realise that the zip at the back would keep opening. At that moment, I thought it was my fault cos I threw it into the washing machine, but no, I checked the zip and it was in perfect condition. 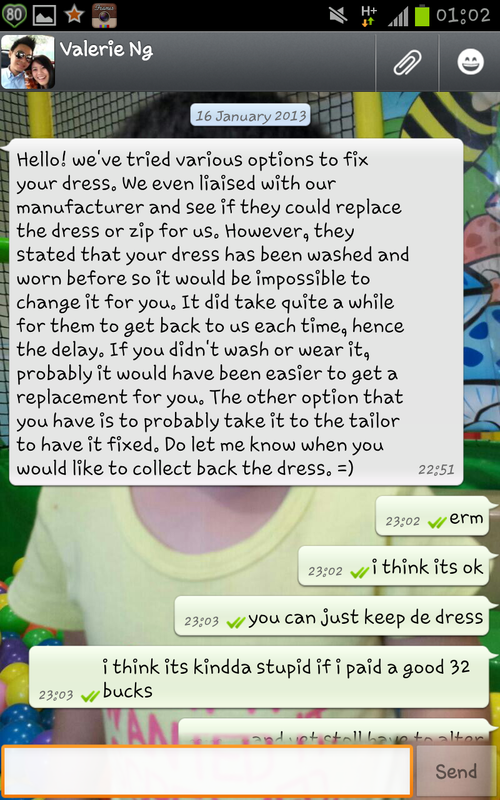 So, I immediately whatapp Valerie (Convo have been deleted as it was close to 3 months back) I MENTIONED MY DRESS WAS BEING WASHED BUT IM PRETTY SURE IT WASNT THE MACHINE FAULT AS THE ZIP WAS STILL IN PERFECT CONDITION. I guess she didnt exactly read my whatsapp which explained why she mentioned in the below msg saying I mentioned it only after giving the dress to her. Just so Im not making this story up, I've decided to post photos of the convo I had with her earlier on and you be my judge if Im doing sth wrong here. And just for their benefit, they did mentioned that washed clothes cant be returned/exchange but fact was if this is the customer service they have for their customer, will you get things from them? I always believe in customer service and I was really shocked when I received her msg cos usually if I have an angry customer I would try my best to figure a problem and even offer to have her next set of nails done at a discounted rate to see where the faults lies. Of cos, if the customer is lying I would be able to see (I have been in the nail industry for 2 yrs before attending a nail school & opening my own business.) 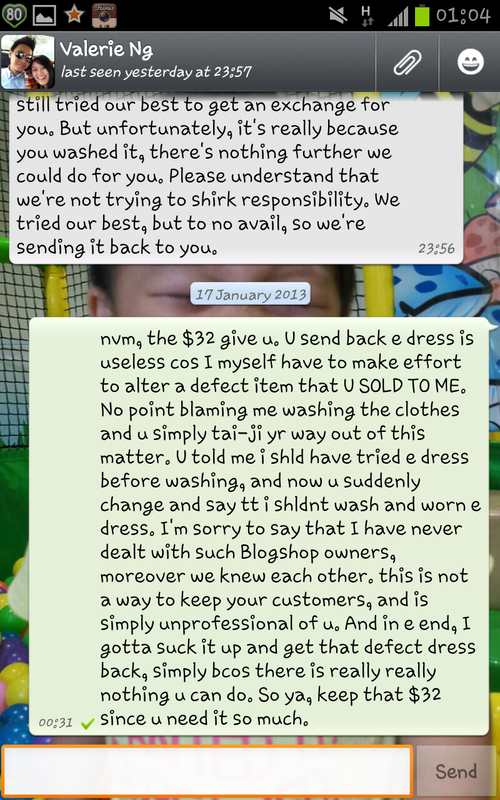 Customer Service has always been my value in my business, but seeing her reply I guess she should do something about her service/attitude towards her clients. 1. Their policy stated that once item have been washed, there will not be an any exchanges / refunds made which it's perfectly normal because it's a common policy that most retail and online stores will state. 2. According to your friend's replies, she didn't replied in a rude manner. She stayed calm and tried to explain to you. Despite you being mad in the conversations, she still remained calm. According to your blog post, you stated that you had checked for any loose threads, and tested the zip was usable BEFORE you threw it into the washing machine so BY RIGHT, there's nothing wrong with the dress itself. It's not about whether you bothered to use the dress or not because the fact that you had already checked and tried the zips that the dress was fine. After the item was being washed, the zip may be in excellent condition and it doesn't matter whether the zip kept opening at the back. Because you already washed it and there may be a chance that it was because of the washing machine that causes it. A high chance. I find that your friend was being professional in handing such matters but you're making things hard for her and you should not blame her. Alright, EVEN IF the zip itself is in a perfect state and EVEN IF the zippers had problem at the back. You COULD still hope for a brand new piece from them, and they most probably will send you a brand new piece for you or offer a full refund for that. But the KEY point is, that you ALREADY WASHED them. I think because you have not purchased anything from online stores before and your first purchase led you to a disappointment but it's really not her fault. In the future, remember to check that EVERYTHING is working properly and try it before you wash it. Cause in order to return something back to the online store, must be within ___ working days depending how many days they state in their policy and the item must be BRAND NEW, UNWORN AND UNWASHED and in original packaging. 1. I agree in their policy but if there any well known blogshop that response the way my friend did woul probably lose customers. Trust me, given that I have quite a no. of friends in this line. 2. 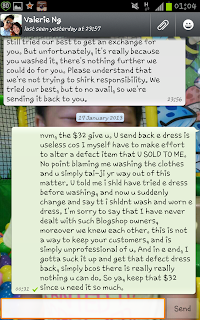 I agree that I was mad but seemly cos she didnt have the intension to try doing sth about it. I have already thought of few ways that she could have dealed with thhis matter instead of just simply pushing the blame to me just cos I washed the dress. 3. Yes, She did took my dress back and tried to find compensation but could I ask you this, am I purchasing the dress from her supplier? or her online shop? And yes I tried the dress and its fine, actually till now de dress is in perfect condition probably just the colour fading part which I cant seem to see and I dun really care too. The zip is still useable but when I wear it, it will open, AND TRUST ME ON THIS IT HAS NOTHING TO DO WITH WASHIN, its the zip problem, not spoilt but using a wrong kind of zip. Just for your information I spend a good 200-300 a month on online shops. Maybe cos I have been buying things from more (what I think is professional) Love bonito, ohvola, TheVelvetdolls,TheTinselRack, Agneselle & alot more. Sorry to mention this but I have return clothes to shops even after a month simply cos I buy things and not even open the bag and only washed and check when I want to use the item. This is my habit, and so far, ALL the blogshop I have contacted was very nice to exchange for me without even complaining. 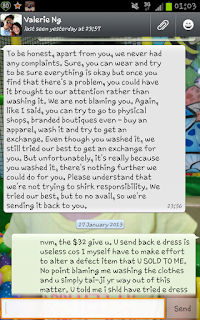 Im not even asking for my fren to exchange a new dress for me. Cos I know I have washed it and I oubt any1 wants it too. But couldnt she at least did the simple thing like sewing a hook or a button unto the dress to prevent the zip from opening? 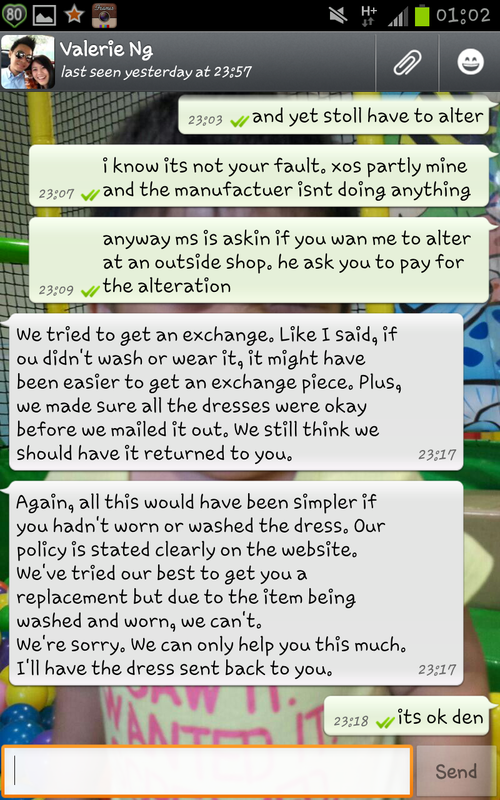 She mention my only other option is to bring it to an alteration shop but why cant she even offer paying for a sewing of JUST A HOOK? 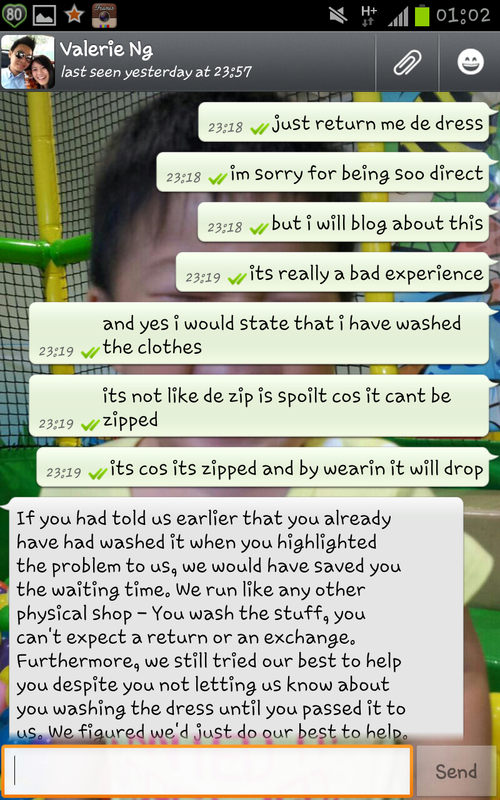 The dress I bought was a premium piece so Im paying for sth which is above normal blogshop quality. So, shdnt I receive sth that is worth the price I pay? Thanks for your tip, but I still stick to "this is THE WORST EXPERIENCE IN THE BLOGSPHERE SHOPPING I HAD (:"
agreed that after washing cant refund is against policy. 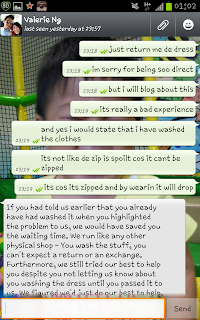 but if washing is the cause of zip malfunctioning, i have to say that the quality is really bad. since blogger did not complain about fabric being worn out, it is safe to assume the fabric is tougher than the zip in this case, which is almost not logical considering the material is it made of and of cos comparing the material and of household zippers and fabrics. 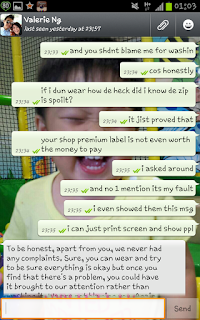 so far i have not encounter any 'loose' zip be it purchase fron retail or online stores. In the case of the really slim chance the zipper will 'loosen' just by washing it, I think there is no other explaination except for bad QC of the item UNLESS the blogger owns an industrial washer which i doubt is the case lol. Terms and policy are fixed as everyone knows that. However a good business person will know when to stretch it to satisfy consumers. Of cos absurd request would definitely be ignored. In this case, it is just the zip that spoilt and I strongly belive if the owner offered to bring it to a tailor to have it replaced at a price that does not turn the sale profit to a loss, the shop would have still at most, break even or make minor profit. I do not know the price of replacing a zipper as I am not a tailor but dealing in the fashion industry the shop should have knowledge of this matter and could have explained the issue to the consumer. Even if the zipper can not be replaced at a low price, explain the situation to the consumer will definitely help her to understand better. Apparently the owner had no foresight to looking further into future purchases of this particular blogger. The shop had been nice to inform the consumer that the factory rejected the item, however, i think this has nothing to do with the consumer. The sales is done between the consumer and the shop, not the factory and the consumer. The manufacturer will be dumb to take responsibility because they produced the goods and sent to you which you would have signed an order to acknowledge the goods are of acceptable condition. Their liability ends there and whatever happens will not be their obligation. Thus I think it is safe to assume non-obligation between consumer and manufacturer with the shop being a middleman. Therefore it will probably logical to expect the manufacturer to reject the goods. I still find it hard to belive zipper can be spoilt by washing machining it. Most pants do have zippers be it big or small, should be of similar quality. What would happen if like the first commentor said, high chance zipper is spoilt by washing machine, tailors will be so rich they do not know where to spend their money. Every household will have pants and pants usually have zippers. Considerin SG having a population of i think above 6million and at least 50 percent uses washing machine, numbers of zip replacement will be astonishing. I do not buy from the shop myself but from this impression and conversation, I conclude the owner may not be a very talented(just in my humble opinion) business/PR person where such trivial matter have to be brought to the manufacturer.Casting away future sales opportunity from this blogger, gaining bad review from this blogger just because a refusal to replace/refund/fixed the item mentioned. Gain a small 1st purchase profit and then losing the customer forever may not be the smartest move. I figured there had to be better ways to approach this problem to leave both parties in better terms and consumer-business relationship. If this was found to be offensive, please ignore as this is just my 2 cent point of view regards ro this situation and not targeting anyone or anything in particular to create any unhappiness or anger between anything or anyone. 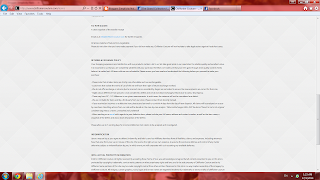 Just wanna pen down about my experience with another blogshop , which is also owned by my friend . Same thing happen , the zipper can't unzip after I washed it , and I only wore the item close to 6months after I bought it . and told me that actually the manufacturer ran out of the item I bought, and they do not have the similar zipper to change . she told me that she could either refund me , or gives me a complimentary piece of the same price in the next launch . 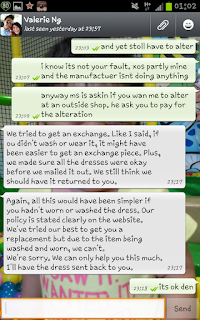 Yes, she did not offers 'bring to tailor outside to amend it', but she gave me alternatives , ignoring her rules. probably she just felt that ,that's basic customer service, moreover towards a friend. Next is , I worked in a boutique before & I experienced customer coming back to the shop with no receipt , saying the item she bought ran out of the usual size. 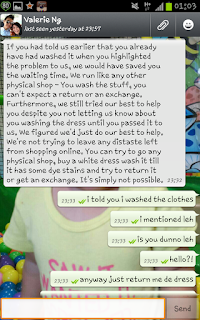 AND PLEASE LA WHO CAN'T TELL IT'S BEEN WASH , RIGHT ? ok so my point is . she kept standing in the shop , saying she did not wash the top, which Obviously have been washed. it was a white top btw . which is like , wash = goes out of size , usually . Thus, I told her in a polite manner that , I can actually smell detergent on the top, as new clothing before washing won't smell so good, and our policy is that we can't get an exchange for washed clothes , and we dont have that stock available anymore , BUT we could give her a 10% discount on the items she bought that day. Thus , she left the shop happy , with new items in her hands, and washing instructions reinforced. Everything is just about customer. so what if your customers ain't happy with you ? if we do not want to handle such customers well, we might as well don't be in this industry and sit in office and do paper works and face bosses , and not clients . Actually, I think you're kind of mean for making things difficult for your friend. 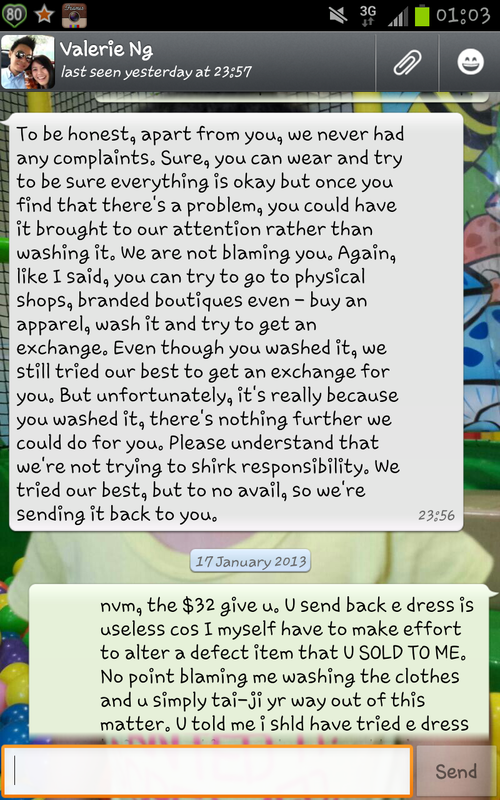 Despite having washed your item, she still took it back to see what she could have helped you to do. She seemed to have went beyond her capability as a friend to even bother contacting the manufacturer to see if it could be repaired - Even though the liaison with between you, the consumer, and her, the blogshop - and your item already violated their return or exchange policy. She didn't reject you immediately, but even offered to help you talk to their manufacturer to get it fixed even when your dress is stained after washing. To me, I think it is completely absurd to ask for an exchange after washing your clothes. 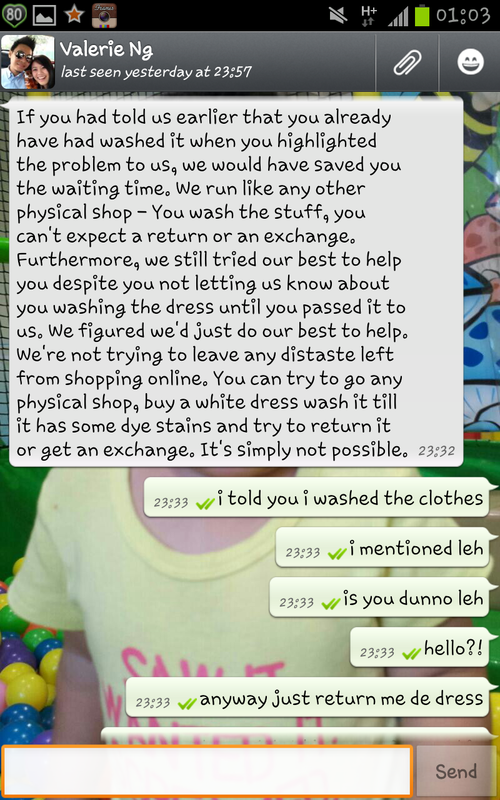 If I found out something was wrong after washing, I'd try to ask and see if the shop would exchange. If not, I wouldn't blame them. By the way, you can't compare both your businesses. Hers is a product business. Yours is a service business. If your service is crappy, of course, who would want to patronise you? I'm not saying you are in the wrong but I think you should take responsibility for what you have done instead of blaming on the shop or your friend. Even LoveBonito doesn't go to lengths the way she did for you. And from the way your friend spoke with you over the message, I could see she felt bad not being able to help you get it fixed. I'm not sure. She might be new, so she probably doesn't know how to handle customers like you. But I do agree with you that she probably don't know much about customer service. Every store has their policy, unfortunately, your "missing evidence" doesn't help you much in your case. Next time, try your clothes first before putting it in the washing machine to minimize thee risk of having to deal with such things. I still think it's not your friend's fault. This is probably one of those transactions gone wrong. Just my thoughts, not against you or anything. Thanks for your comment and yes I am a very straight forward person which makes me a mean person. 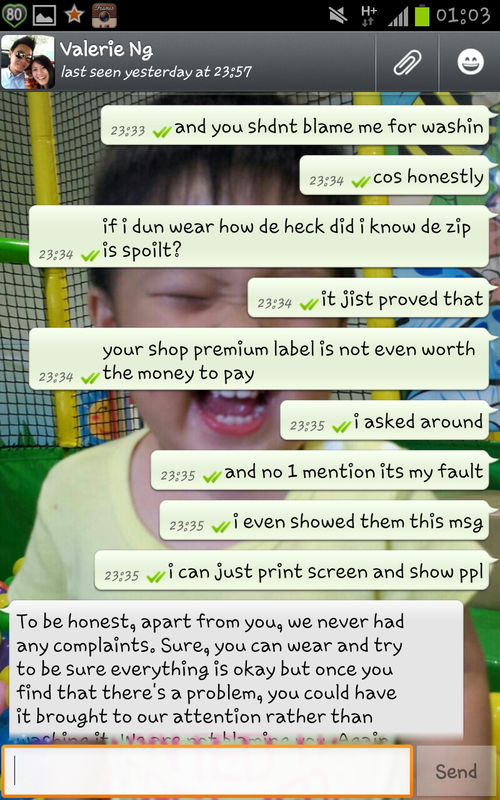 just fyi all business needs customer service, if you dont have it dun expect your business tp be good. and to add on, you have been the only person that felt i am mean. every other frens/customers felt I was right to actually let known to public what her services is like. 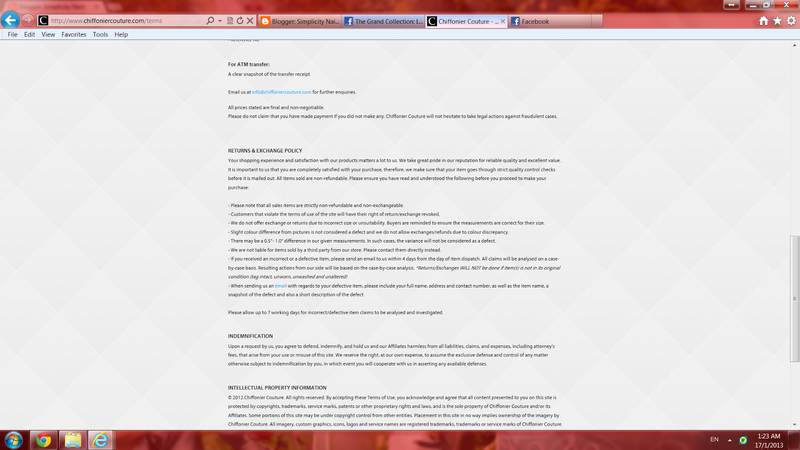 Im sure the public can see these msges and judge thru de printscreens, what i have pen down and what you have typed. So like I have mention if there is any fan pf theirs here go ahead and support them. I am just expressing my thoughts/views here. And i still think I did no wrong typing this post.